On 29 July 2017 the Town Council’s War Memorial Working Party proposed to lead a Commemoration of the start of the Third Battle of Ypres, commonly known as the Battle of Passchendaele. Members of the public were strongly invited to join us at 10.45am outside the Town Hall when the traffic was halted for a One Minute Silence followed by the reading of the names of the 27 local men who perished in the campaign, which began on 6 June and reached its bloody climax between 31 July and 10 November 1917. 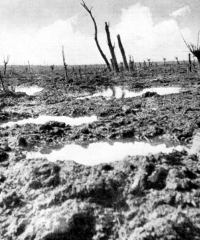 Besides the appalling loss of life troops had to endure the mud cause by an unusually wet summer. Despite the losses, the campaign was deemed a success when the village of Passchendaele, situated on a strategic ridge, was captured. Already in the early summer of 1917, five local men had been killed pursuing the Germans in their retreat to the new Hindenburg Defensive Line while another seven men had been lost at Arras as we supported our French allies, whose army had mutinied as the desired breakthrough had not been achieved. Because of their “indomitable pluck” British soldiers did not mutiny and so Field-Marshal Haig was also now free to pursue the battle on his preferred front - near Ypres, which had been held with huge casualties since the start of the war. This battlefield in North West France was near the Channel ports vital for supplying the army. Before the battle could start preparations were necessary and so in June 1 a Tewkesburian was killed capturing the Ridge at Messines and another in an abortive attempt to capture the submarine base at Zeebrugge, fatefully known as Operation Hush. Another was lost in the inevitable trench warfare. One of the dead was the first loss of a Tewkesburian serving with the fledgling Royal Flying Corps [to be renamed the RAF on 1 April 1918]. We hope that you will join our salute to the memories of these brave men.